Paper size approx: 24.4 x 40.2 cms. Title: 'A Map Of Cyprus'. From Richard POCOCKE A Description of the East and Some other Countries W. Boyer, London, 1743 - 1745. 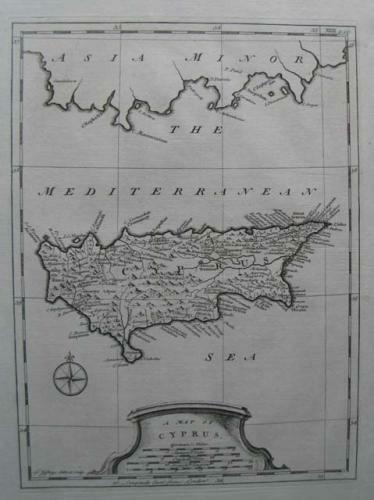 A striking and hightly detailed copper engraved map of Cyprus. Map includes a lot of topographical details as well as cities, rivers, mountains. Map adorned with a decorative title cartouche and a compass rose. Mapmaker: Thomas Jefferys (1695 - 1771) was one of the most prominent and prolific map publishers and engravers of his day. Our first records of Jefferys appear in the 1735 when he was apprenticed to Emmual Bowen. Later, in the 1740s he engraved several maps for the popular periodical The Gentlemans' Magazine. Around 1740 Jefferys was finally able to go into business for himself and in 1746 received an appointment as "Geographer to Fredrick, Prince of Wales", which shortly after translated to the position of "Royal Cartographer to King George III". While not specifically a cartographer, Jefferys specialized in compiling and re-engraving the works of earlier cartographers into coherent cartographic wholes. While not salaried position, Jefferys appointment as "Royal Cartographer" allowed him preferential access to the most up to date cartographic material available. He his best known for his maps of the America, particularly The American Atlas, which included some of the finest and most important late colonial ear maps of America ever published. Despite his prolific publishing history, royal appointments, and international publishing fame, Jefferys lived most of his life in dire economic straits. It is recorded that he had to be bailed out of bankruptcy by the Sayer firm during the publication of The American Atlas. In the end Jefferys died with very little. Nonetheless, his cartographic legacy survived him, even after his death in 1771, many of his important maps continued to be published and republished by Sayer and Bennet, Lotter, La Rouge, and others. Many attribute some of Jefferys best maps to the colorful and criminally inclined cartographic genius Braddock Mead, who is considered the "secret behind Jefferys". Jefferys was succeeded by his son, also Thomas, who had little success as a cartographer and eventually sold his stock to William Faden.